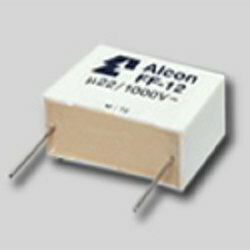 Our organization is indulged in offering Polypropylene Axial Film Capacitor (FF 12) to our clients. These have non-inductive wound construction. These are widely used in temperature compensation circuits, timing, oscillator circuits. Our organization is offering a broad range of Polyester Film Capacitors to our prestigious clients. Offered products are widely demand due to their low maintenance cost. 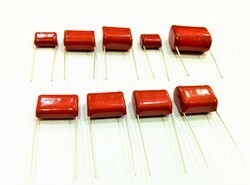 We are engaged in offering Advance Metallised Polyester Capacitors - Axial/Radial/ type to our clients. These capacitors are rectangular in shape and are provided with radial leads for easy PCB mounting and a high packaging density. These are encased in flame retardant Nylon or PBT cases and completely potted in epoxy to provide superior moisture, shock and vibration protection. General Purpose Capacitors MEB/MED Series with Metalized polyester, box & dip type. Being a reputed firm of the industry, we are offering a top notch quality range of Polyester Capacitor to our valuable clients. These light weighted products are manufactured by our suppliers using quality approved raw material which is fit according to industry laid norms. Having features like Low Inductance, Precisely designed, energy efficient.